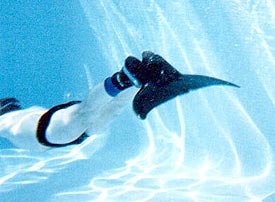 The picture shows the ease and grace of movement that the DOLPHIN MONOFIN allows you in swimming. 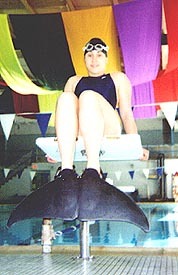 Here, a swimmer is able to propel her body out of the water and easily cross a pool divider using the DOLPHIN MONOFIN! DOLPHIN MONOFINS are truly the future of swimming. Fin Swimming Competitions are coming to the USA. Other nations have over thirty years experience with Fin Swimming. The Army has lead the way in the USA, the National Fin Swimming Championships originating at the West Point Academy just ten years ago. Stay tuned to this site for Fin Swimming Competition updates! Best of all, the DOLPHIN MONOFIN is as attractive as it is useful!